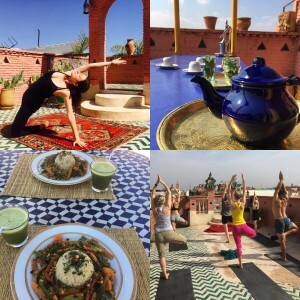 Beach Yoga Retreat Morocco – Rest, relax and rejuvenate by the ocean in the bright and breezy coastal town, Essaouira. 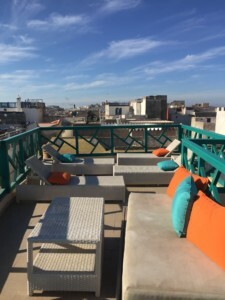 Essaouira is only a 2 hour car journey from Marrakech city. 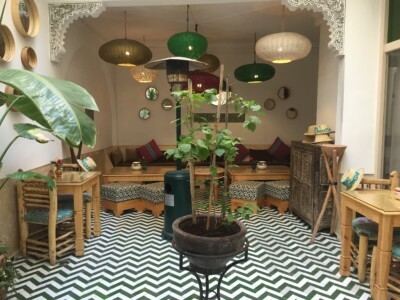 Your airport pick up and drop off is included in your stay and you can fly to Marrakech airport or Essaouria airport. This week is all about rest, relax and rejuvenation. 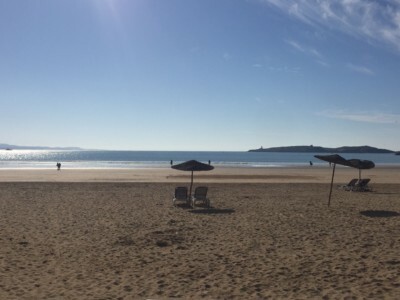 Walk along the beach, swim in the ocean, stretch with Yoga and enjoy the relaxed and laid back vibes of Essaouira coastal town. 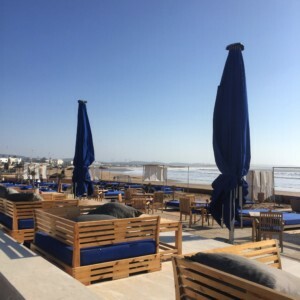 A lovely pollutions free and hassle free environment where you can walk in peace, sip coffee, juice or enjoy a drink or a beer overlooking the beautiful coast. You will be staying in Essaouria, 2 min walk from the beach. 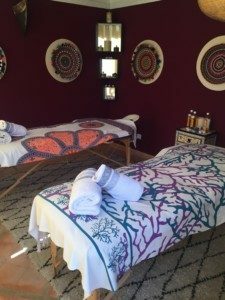 The venue has 6 rooms, a lovely rooftop with stunning views a big courtyard with open roof and a beautiful massage & treatment room inside the venue. The Beach Yoga Retreat is for everyone. 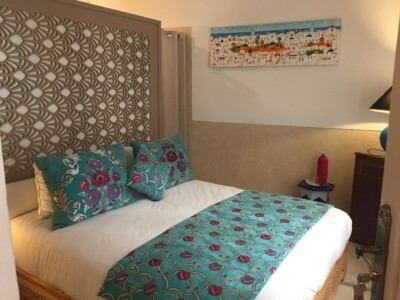 The energy is laid back, the vibes are positive and Sally Goldfinger will make sure you’ll have a wonderful stay. 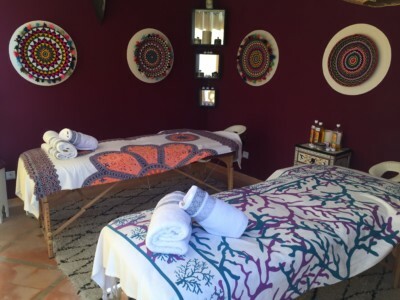 The Retreat is ideal for solo travellers who are looking for a week of rest and relaxation in a stress free environment. 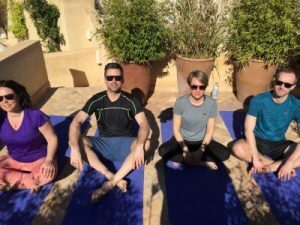 Most people who join Sally’s Retreats are either new to Yoga or intermediate and many have tried Yoga a few times without any consistent practise, so don’t worry. Come as you are and leave all your worries behind you. All classes are optional. Food is delicious and plentiful. No starvation or strict regime. 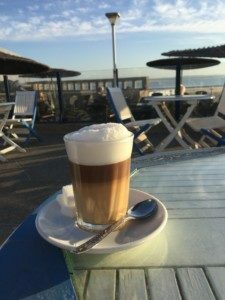 You will most probably find Sally hanging out in the local gelateria eating ice-cream and living life with a smile welcoming you with a warm heart. Booking Form - Please leave no field blank. 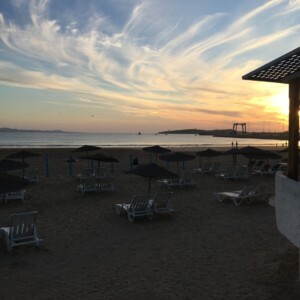 Essaouira is a lovely and very laid back coastal town (only 2 hours by car from Marrakech). 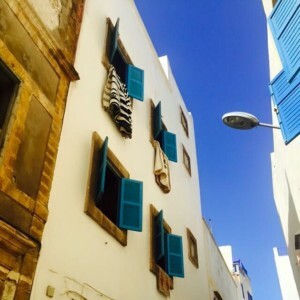 The energy of Essaouira is relaxed and charming. The place is pollution free and hassle free. With its vibrant blue and white colour it is a paradise for a beach holiday with a lovely beach and relaxed beach promenade stretching for miles. 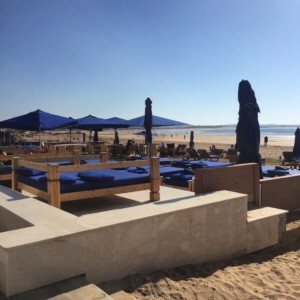 The sun is always shining in beautiful Essaouira, and the sky is always blue. From December-March the sun is out all day but the temperatures are cooler (15-21 degrees), and early mornings and evenings are much cooler. In the summer there is a lovely breeze which makes the temperatures pleasant. 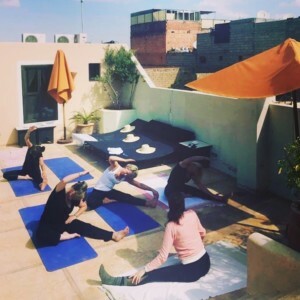 On your Retreat your Yoga sessions are designed according to your needs and classes are suitable for everyone, no matter experience. Most people are beginners or have done a few classes here and there before attending the Retreat, so don’t worry. 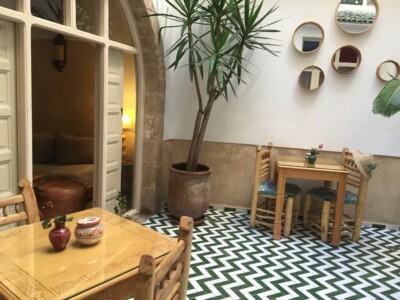 We will practise on the rooftop or the charming courtyard downstairs (the courtyard has an open roof). 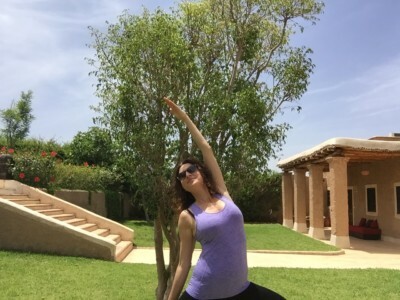 Sally is specialising in Yoga Therapy and Ayurveda Nutritional Wellness and is able deliver a complete personalised Yoga program if you want to go deeper in your practise, and have a program you can use at home too. The Yoga sessions will be fun, inspiring and suitable for every level at the same time. Morning sessions begin 8.30-9.45. Breakfast is served after class. There will be fruits and tea to snack on before the morning sessions. Afternoon classes 5.30-6.45 followed by a delicious dinner. 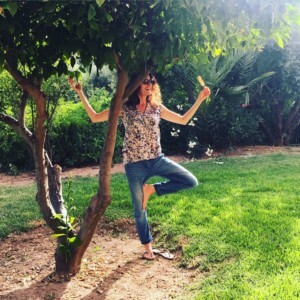 Sally Goldfinger is your private Yoga Teacher & Holistic Wellness Expert – you most probably find her with a gelato in her hand in the summer. This lovely ocean bliss retreat is suitable for everyone. Most participants come alone, so don’t worry if you travel on your own. You will have fun and connect with like-minded people. 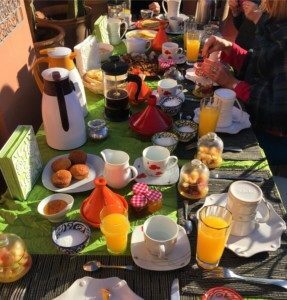 During your stay you can book a lovely day trip to Marrakech if you are curious to explore Marrakech city or simply stay all week in Essaouria and enjoy the ocean and fresh breeze. From 2pm. No Yoga on arrival day. Dinner at 7.30 pm. Don’t worry if you arrive later. Dinner will be arranged for late arrivals too. 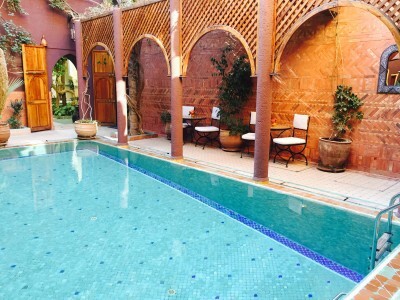 If you arrive in Marrakech airport you have an included transfer. Please note, that the included transfer is 12pm. If you arrive later you would need to arrange your own transfer. We can help you book a driver. 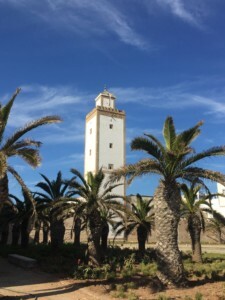 You can also take a bus straight to Essaouira from Marrakech. Please make sure you check out 11.00 (rooms). You have an included drop off to Marrakech airport on 19th July. The driver will come to collect everyone at 12pm. If your flights is earlier or later, you would need to arrange your own transfer. We can help book a driver for you. You will be picked up at the airport 12pm by one of our reliable local drivers. The drive is smooth and easy, and there will be a juice/lunch/coffee break on the way. A cancellation less than six weeks before the holiday begins: We apologize, but we are unable to refund any payment. 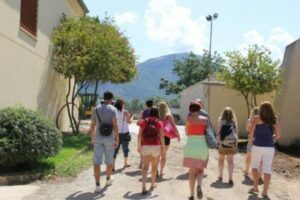 A cancellation between 6- 8 weeks before the holiday begins: We will refund 50% of the total cost. Please note: We do not accept any liability for cancellations, delays or changes caused by closure of airports, civil strife, industrial action, natural disaster, technical problems to transport, staff cancellations, terrorist actions or threats, unforeseen changes in your personal circumstances, sudden death in the family, or other events beyond our control, such as participants’ medical or psychiatric conditions which may develop during or subsequent to the Retreat; loss of, or damage to, personal property of participants. We are not liable for any injuries you may incur. Yoga classes & use of our facilities are undertaken at your own risk.